An epileptic seizure is defined as “an excessive burst of abnormally synchronized neuronal activity affecting small or large neuronal networks that results in clinical manifestations that are sudden, transient, and usually brief.”1 Epilepsy is characterized by recurrent seizures secondary to a predisposition to generate abnormal electrical discharges from cortical grey matter, and is complicated by subsequent neurobiological, cognitive, psychosocial and occupational consequences. Up to 10% of the population will have at least one seizure in their lifetime, but only about 2% of the population will develop epilepsy. Seventy million people in the world have epilepsy, with between 34 and 76 new cases per 100,000 diagnosed every year.2 The annual incidence of epilepsy in the U.S. ranges between 15 and 71 per 100,000 person-years.3 In general, children and elderly individuals have a higher incidence of epilepsy than young and middle-aged adults.3 Fortunately, 70% of these cases are controlled by anti-epileptic medications. However, the remaining 30% of those with epilepsy have drug-resistant seizures.4 Functional neurosurgery offers a potential cure to these patients if the seizure focus can be localized and safely resected. Imaging, therefore, is critical to potentially identifying the etiology of seizure activity and to guiding therapy. Seizures are classically defined as either generalized or partial (Table 1). Essentially, in generalized seizures the onset is global and with partial seizures the onset is focal. Both generalized and partial seizures are more common in children than in adults.5 Overall, the incidence of partial seizures is greater than primary generalized seizures. With generalized seizures, there is an immediate loss of consciousness, sometimes accompanied by generalized convulsions not localizing to a specific anatomic location and without recollection of the event.6 Structural lesions are less likely to be discovered with primary generalized seizures (eg, in childhood absence epilepsy), but are very common with partial seizures. Partial seizures demonstrate focal onset such as auras or focal motor symptoms mapping to a specific anatomic area or areas.6 Partial seizures are further characterized as simple, where consciousness is preserved, or complex, where there is loss of consciousness. Rapid secondary generalization of partial seizures can occur, sometimes confusing the clinical picture. Magnetic resonance imaging is the modality of choice to evaluate the structural etiology of a seizure and to assess the potential need for surgery. Computed tomography may be the study of choice in an emergent situation. It is vital to consider patient demographics, such as age and clinical history (including a history of malignancy), as well as type and chronicity of seizure activity, to address the most common and critical etiologies in the imaging protocol design (Table 2). Resources are best used when new seizure patients are triaged to routine screening brain imaging protocols, while refractory epilepsy cases should undergo more detailed, high-resolution protocols. When designing the MRI protocol, it is important to recognize the superiority of 3T to 1.5T MR imaging, which includes increased contrast-to-noise ratio, as well as spatial and anatomic resolution.7,8 Depending on the expected common pathologic entities in a particular demographic group, certain MRI sequences may be added to increase diagnostic yield. With a new-onset seizure, the imaging priority should be focused on ruling out an acute process, rather than visualizing a subtle epileptogenic focus. For example, venous infarction related to dural venous sinus thrombosis may be the suspected underlying cause of a new-onset seizure in the pediatric population; thus, an MR or CT venogram should be performed. In individuals with epilepsy, thin-section 3D coronal oblique T1 gradient echo and coronal oblique T2 series are added to assess for more subtle abnormalities, including hippocampal sclerosis or cortical dysplasias. High-resolution 3D sequences and T2 FLAIR (fLuid attenuated inversion recovery) images increase the sensitivity to subtle cortical dysplasia and other abnormalities, including neoplasms.9 Our goal here is to provide an efficient and practical imaging approach to evaluating children and adults with seizures of all types. For the 10% of individuals who experience a seizure their lifetime, the majority (two-thirds) will represent a new-onset, nonrecurring seizure.10 Peak prevalence is bimodal (< 1 yr and > 55 yrs of age). The imaging approach is driven by empiric observation of the most common and critical etiologies of seizures, which varies by age of presentation. New-onset seizures represent the most common neurologic emergency of childhood, with approximately 4-10% (150,000) of children and adolescents per year presenting for evaluation of a newly occurring seizure disorder.11 Only 20% of these patients will go on to develop epilepsy. Screening MRI examination of the brain, with or without contrast, is typically adequate to evaluate the broad differential in these patients, with important exceptions in the setting of neonatal seizure and venous thrombosis, as detailed below. Specialty sequences needed to uncover subtle cortical abnormalities, such as thin-section 3D gradient echo T1 with multiplanar reconstruction, should be generally reserved for patients with chronic epilepsy (Table 2). The most frequently occurring condition associated with acute seizures in children is a febrile illness, with febrile seizure representing a unique entity in the pediatric population.11 Most patients present with “simple” febrile seizures, as defined by the American Academy of Pediatrics, and have been shown to carry no greater risk for having meningitis than those who have a fever without a seizure.12-14 However, a subset of “complex” febrile seizures, particularly in the instance of febrile status epilepticus, carries an increased risk of bacterial meningitis (12-18%).15, 16 Acute bacterial meningitis often presents with no or nonspecific imaging findings; however, if present, basic MRI with and without contrast is the most sensitive and specific modality. Findings can include abnormal leptomeningeal and pachymeningeal enhancement, abnormal cortical FLAIR signal, diffusion restriction, and/or hydrocephalus (Figure 1). In cases of suspected meningitis, a subtle communicating hydrocephalus may be the only imaging sign at presentation, so careful evaluation for dilatation of the temporal horns and third ventricle is required. Ultimately, diagnosis of meningitis relies on cerebrospinal fluid sampling. For new-onset pediatric seizure patients presenting without fever, basic MRI examination is the preferred examination for work-up.17, 18 Intracranial masses are less likely to be a cause of acute seizures in pediatric patients than in adults, as the majority of childhood CNS tumors occur in the posterior fossa, without the supratentorial cortical involvement typically implicated in seizure activity. Evidence of prior trauma should be closely sought for in the typical locations, including the anteroinferior frontal and temporal lobes. Multiple small foci of T2* susceptibility suggestive of diffuse axonal injury also may implicate trauma as an etiology for new seizures in an adult (Figure 7). After experiencing a first seizure, the recurrence risk of a subsequent seizure is approximately 25-50%. The risk of additional seizures increases after two seizures, and therefore, antiepileptic drug therapy is typically instituted after the second seizure.1 As previously discussed, the challenge in epilepsy imaging is to identify the most likely and most important potential pathologies in each patient based on age, clinical history and type of seizure activity, in order to best direct the imaging resources and protocols. Pediatric patients with chronic medically refractory epilepsy are affected with different pathology compared to patients with new-onset seizures and require specialized imaging. While patients with acute seizures can be adequately evaluated with a basic MRI exam, protocols for epilepsy should include high-resolution multiplanar imaging, including a coronal T1 3D GRE sequence. This sequence is particularly helpful when seeking to detect subtle structural abnormalities, such as cortical dysplasias, heterotopic grey matter, phakomatoses, cavernous malformations, low-grade tumors, and mesial temporal sclerosis. Abnormalities of cortical development are often associated with epilepsy, especially drug-resistant epilepsy. These cortical developmental anomalies can be grouped into three categories: 1) abnormal proliferation of neurons and glia; 2) abnormal migration of postmitotic neurons to the cortical plate; and 3) abnormal cortical organization and elaboration of connections.26-28 Table 3 lists many of the abnormalities of cortical development into these categories. Figure 10 illustrates the embryologic process of cortical development graphically, and demonstrates examples of the malformations associated with each category. Similar to pediatric patients, adults with epilepsy require more detailed MRI protocols. In addition to standard MRI pulse sequences, thin-section coronal T2, T1 3D GRE, and FLAIR sequences should be included to evaluate the temporal lobes. A high-resolution T1 3D GRE sequence (e.g. SPGR, MPRAGE, or BRAVO) is particularly useful for detecting subtle cortical dysplasias. Leading considerations in an adult with epilepsy include mesial temporal sclerosis, cavernous malformations (‘cavernomas’), cortical dysplasias, neoplasm, and sequelae of prior trauma or infarction.29 A T2* gradient echo sequence in the axial or coronal plane is necessary to evaluate for evidence of hemosiderin deposition related to prior trauma or cavernomas. Tumors should always be excluded in an adult with epilepsy, since even longstanding cases can harbor low grade neoplasms (Figure 11). While high-grade glial neoplasms and metastatic disease often present acutely with new onset seizures, lower grade malignancies such as ganglioglioma, pleomorphic xanthoastrocytoma, dysembryoplastic neuroepithelial tumor (DNET), and pilocytic astrocytoma often localized to the neocortical areas and can present clinically and radiographically similar to cortical dysplasias. In medically refractory epilepsy patients, careful analysis for signs of mesial temporal sclerosis is undertaken, as it is the most common pathology found in these patients. The main radiologic findings of mesial temporal sclerosis are hippocampal atrophy, internal structural derangement and T2 hyperintensity; among these signs, atrophy is the commonest and most reliable (Figure 12). This condition is rare before the age of 10 yrs. While the pathogenesis is unknown, it may be related to prior infection or febrile seizures as a child. This condition is characterized by hippocampal atrophy and gliosis best seen on coronal T2 FLAIR imaging as hippocampal volume loss with associated increased T2 signal and loss of grey white differentiation. Mass effect and enhancement are not seen with mesial temporal sclerosis. Imaging findings of mesial temporal sclerosis can be very subtle and evaluation of the ipsilateral amygdala, temporal lobe white matter stem, fornix, and mammillary body can be useful in detecting subtle cases. Epilepsy is ultimately a functional grey matter disturbance, not a structural disease; it is therefore critical to recognize that any discovered imaging abnormalities need to be correlated with clinical seizure type and EEG features before causality is implicated. Care must also be taken not to confuse the transient post-ictal consequences of seizures (eg, PRES) as a cause of seizures. Proper evaluation of epilepsy requires a multimodality and multidisciplinary approach. PET scanning is useful in cases of neocortical epilepsy, where interictal hypometabolism corresponds to areas of concern. Electroencephalography and magnetoencephalography are additional noninvasive methods to localize seizure foci. Ultimately, invasive monitoring may be required if surgical intervention is considered (Figure 13). If surgery is considered, patients may undergo functional MRI (fMRI) imaging to map the proximity of seizure foci to areas of the brain associated with a specific function, such as speech and language, motor, or memory. 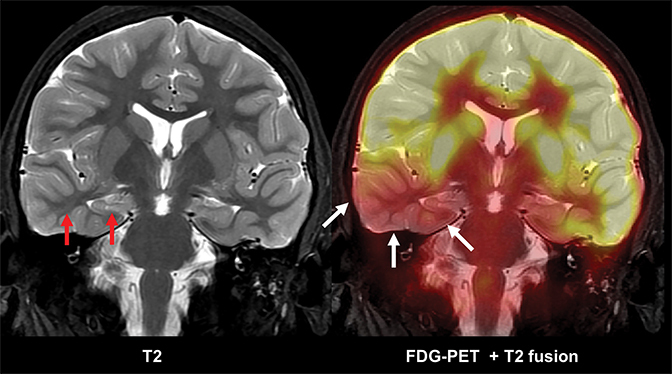 Multimodality 3D fusion techniques, such as fusing MR and PET images, allows for better anatomic correlation to areas of hypometabolism.30 Areas shown to be abnormal or questionable by PET, SPECT, MEG, fMRI and spectroscopy studies can be coregistered to a common MR image set (Figure 14). This allows simultaneous comparison of the structural-functional relations among the various modalities. Using this approach, the areas where multiple modalities overlap are deemed as possible epileptogenic areas. Increasingly available are fMRI techniques to help localize seizure onset. These methods are based on the MR detection of both cerebral blood flow effects as well as small shifts in the relative amounts of oxyhemoglobin vs deoxyhemoglobin in the vascular bed. As such, fMRI is typically limited to recording events occurring on the timeframe of seconds. Since epileptogenic spikes last just milliseconds, only very frequent ictal activity or longstanding interictal activity might be localized with fMRI. Nonetheless, several investigators have reported preliminary success using fMRI in epilepsy localization and characterization.31-33 Of particular interest, the ability to trigger the fMRI acquisition based on real-time EEG monitoring may provide a more detailed understanding not only of the areas involved in certain physiologic events, eg, focal epilepsy or cognitive processing, but also of the sequencing of the activation of the involved regions.34 fMRI also affords the opportunity to perform noninvasive functional mapping to aid pre-operative planning. Such innovative fMRI approaches are likely to bring new insight into our understanding of the epileptogenic zone. Evaluating patients with new-onset seizures and epilepsy requires a multimodality and multidisciplinary approach. Imaging has a vital role in both identifying causative factors and guiding therapy. Clinical history and patient age, as well as type and chronicity of seizures, guide differential considerations and imaging protocol design. Imaging evaluation of new seizures employs basic MR imaging protocols, while epilepsy often requires more advanced imaging techniques, including multiplanar thin-section 3D MRI acquisitions, multimodality fusion and functional MRI. Tamber MS, Mountz JM. Advances in the diagnosis and treatment of epilepsy. Semin Nucl Med. 2012;42:371-386. Ngugi AK, Kariuki SM, Bottomley C, et al. Incidence of epilepsy: a systematic review and meta-analysis. Neurology. 2011;77:1005-1012. Bakaki PM, Koroukian SM, Jackson LW, et al. Defining incident cases of epilepsy in administrative data. Epilepsy Res. 2013;106:273-279. Kwan P, Schachter SC, Brodie MJ. Drug-resistant epilepsy. N Engl J Med. 2011;365:919-926. Kotsopoulos IA, van Merode T, Kessels FG, et al. Systematic review and meta-analysis of incidence studies of epilepsy and unprovoked seizures. Epilepsia. 2002;43:1402-1409. Knake S, Triantafyllou C, Wald LL, et al. 3T phased array MRI improves the presurgical evaluation in focal epilepsies: a prospective study. Neurology. 2005;65:1026-1031. Phal PM, Usmanov A, Nesbit GM, et al. Qualitative comparison of 3-T and 1.5-T MRI in the evaluation of epilepsy. AJR Am J Roentgenol. 2008;191:890-895. Hauser WA. The prevalence and incidence of convulsive disorders in children. Epilepsia. 1994;35 Suppl 2:S1-6. Teach SJ, Geil PA. Incidence of bacteremia, urinary tract infections, and unsuspected bacterial meningitis in children with febrile seizures. Pediatr Emerg Care. 1999;15:9-12. Kimia AA, Capraro AJ, Hummel D, et al. Utility of lumbar puncture for first simple febrile seizure among children 6 to 18 months of age. Pediatrics. 2009;123:6-12. Agarwal M, Fox SM. Pediatric seizures. Emerg Med Clin North Am. 2013;31:733-754. Chin RF, Neville BG, Peckham C, et al. Incidence, cause, and short-term outcome of convulsive status epilepticus in childhood: prospective population-based study. Lancet. 2006;368:222-229. Teng D, Dayan P, Tyler S, et al. Risk of intracranial pathologic conditions requiring emergency intervention after a first complex febrile seizure episode among children. Pediatrics. 2006;117:304-308. Hirtz D, Ashwal S, Berg A, et al. Practice parameter: evaluating a first nonfebrile seizure in children: report of the quality standards subcommittee of the American Academy of Neurology, The Child Neurology Society, and The American Epilepsy Society. Neurology. 2000;55:616-623. Gaillard WD, Chiron C, Cross JH, et al. Guidelines for imaging infants and children with recent-onset epilepsy. Epilepsia. 2009;50:2147-2153. Abend NS, Wusthoff CJ. Neonatal seizures and status epilepticus. J Clin Neurophysiol. 2012;29:441-448. Kersbergen KJ, Groenendaal F, Benders MJ, de Vries LS. Neonatal cerebral sinovenous thrombosis: neuroimaging and long-term follow-up. J Child Neurol. 2011;26:1111-1120. Chan AK, Deveber G, Monagle P, et al. Venous thrombosis in children. J Thromb Haemost. 2003;1:1443-1455. Bradley WG, Shey RB. MR imaging evaluation of seizures. Radiology. 2000;214:651-656. Bronen RA. Epilepsy: the role of MR imaging. AJR Am J Roentgenol.1992;159:1165-1174. Kotagal P, Rothner AD. Epilepsy in the setting of neurocutaneous syndromes. Epilepsia. 1993;34 Suppl 3:S71-78. Goodman M, Lamm SH, Engel A, et al. 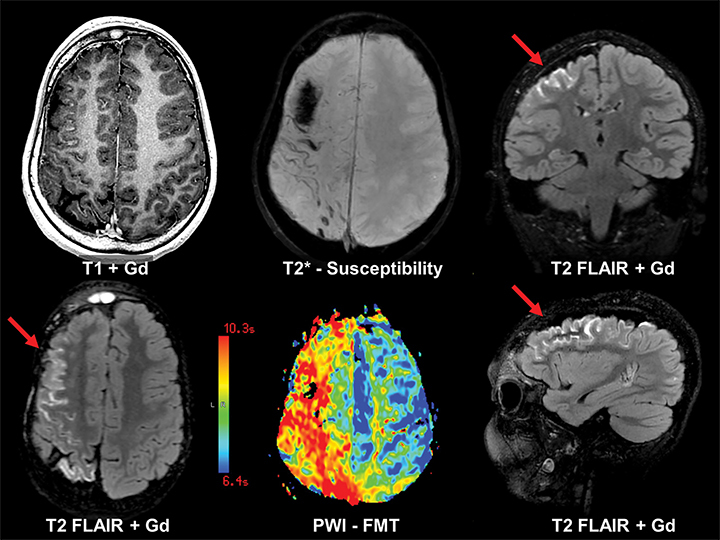 Cortical tuber count: a biomarker indicating neurologic severity of tuberous sclerosis complex. J Child Neurol. 1997;12:85-90. Barkovich AJ, Kuzniecky RI, Dobyns WB. 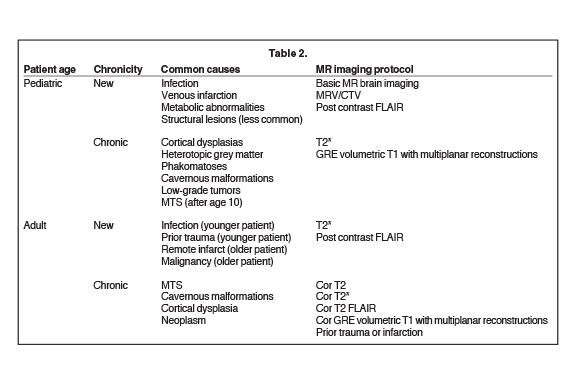 Radiologic classification of malformations of cortical development. Curr. Opin Neurol. 2001;14:145-149. Barkovich AJ, Kuzniecky RI, Jackson GD, et al. A developmental and genetic classification for malformations of cortical development. Neurology. 2005;65:1873-1887. Marin O, Rubenstein JL. 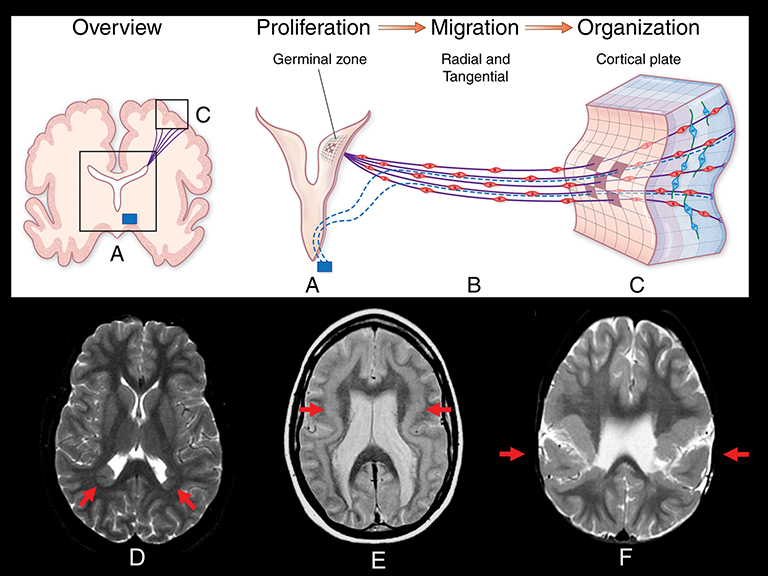 A long, remarkable journey: tangential migration in the telencephalon. Nat Rev Neurosci. 2001;2:780-790. Berg AT, Millichap JJ. The 2010 revised classification of seizures and epilepsy. Continuum. 2013;19:571-597. Lee KK, Salamon N. [18F] fluorodeoxyglucose-positron-emission tomography and MR imaging coregistration for presurgical evaluation of medically refractory epilepsy. AJNR Am J Neuroradiol. 2009;30:1811-1816. Cendes F. Neuroimaging in investigation of patients with epilepsy. Continuum. 2013;19:623-642. Fahoum F, Zelmann R, Tyvaert L, et al. Epileptic discharges affect the default mode network—FMRI and intracerebral EEG evidence. PloS one 2013;8:e68038. McDonald BC, Hummer TA, Dunn DW. Functional MRI and structural MRI as tools for understanding comorbid conditions in children with epilepsy. Epilepsy Behav. 2013;26:295-302. Schomer DL, Bonmassar G, Lazeyras F, et al. EEG-Linked functional magnetic resonance imaging in epilepsy and cognitive neurophysiology. J Clin Neurophysiol. 2000;17:43-58. Epilepsy imaging: Approaches and protocols. Appl Radiol. Dr. Hartman, Dr. Nace, Dr. Maksimovic and Dr. Rowley are with the Department of Radiology, Neuroradiology Section, University of Wisconsin, Madison, WI. Dr. Rusinak is with the Radiology Department at Northwestern University, Chicago, IL.